accelerations being present or absent. Category 1 tracings are reassuring. Category III FHR tracings are abnormal. Category III tracings are associated with abnormal fetal acid–base status at the time of observation. 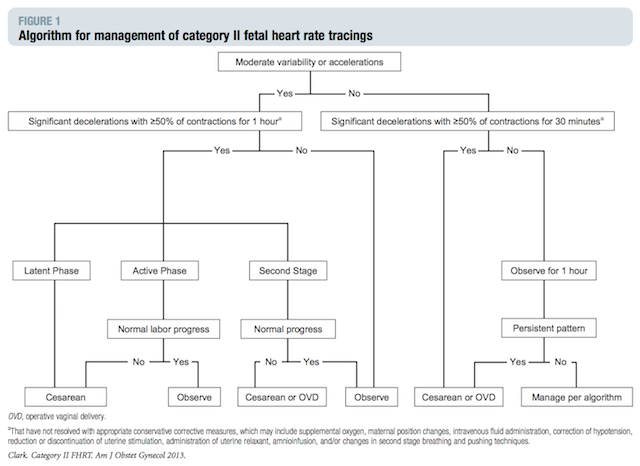 Category III FHR tracings require prompt evaluation. Depending on the clinical situation, efforts to expeditiously resolve the abnormal FHR pattern may include but are not limited to provision of maternal oxygen, change in maternal position, discontinuation of labor stimulation, treatment of maternal hypotension, and treatment of tachysystole with FHR changes. If a Category III tracing does not resolve with these measures, delivery should be undertaken. All tracings that are not category 1 or category 3 are considered category 2 tracings. The following algorith is for category 2 tracings. Is there moderate variability OR are there accelerations? Previous: Can I Drink Wine During Pregnancy?